The Multi Unit Friction Dampers are based on a rotational friction concept like all Damptech dampers. 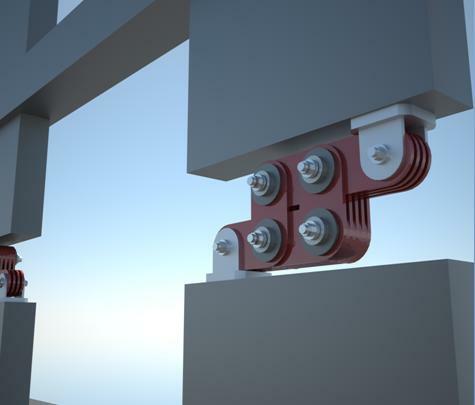 The dampers can be installed in frame structures with diagonal bracings like in the figure below where two dampers with four friction joints each are used. The dampers are connected to the structure with pin connections on both sides. When a lateral external force excites a frame structure with a large force, the top of the frame structure starts to displace horizontally due to this force. The racing system and the frictional forces developed between the frictional surfaces of steel plates and friction pad materials will resist the horizontal motion. 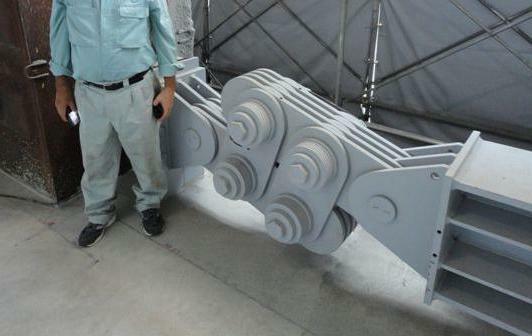 When the frame structure is moved to the left the left damper is lengthened (see figures below) while the right damper is shortened and both dampers dissipate energy. Similarly when the frame structure is moved to the right the right damper is lengthened while the left damper is shortened and the dampers dissipate energy. During an earthquake a frame structure in a building will be moved from left to right repeatedly and thus dissipating energy as the dampers are lengthened and shortened. The movement of a single damper device when the frame structure is displaced to the maximum horizontal displacement can be seen in the figure below. The innovative methods for control of seismic vibrations such as the base isolation and passive energy dissipation are considered nowadays fully mature technologies for earthquake protection of people, facilities, buildings and their content. 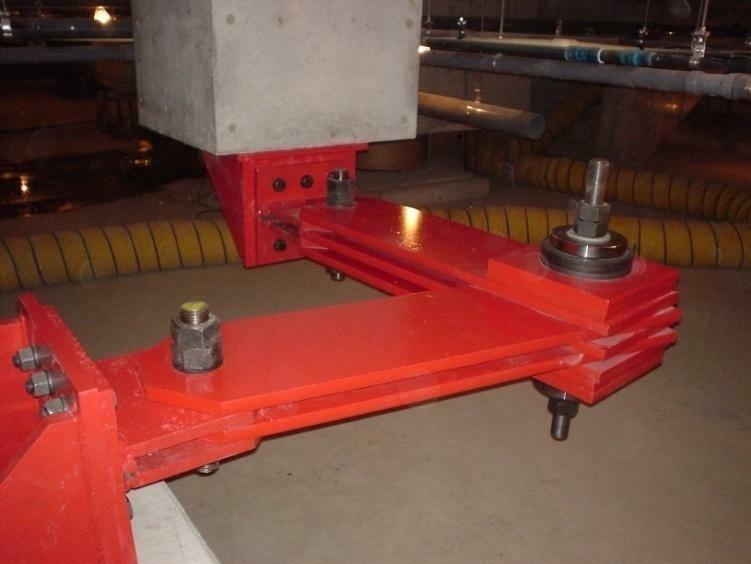 Frictional and other types of damping devices are important integral part of seismic isolation systems as they serve as a barrier against the penetration of seismic energy into the structure. In this concept, the dampers suppress the response of the isolated building relative to its base as shown in the test model layout below. With its simple design and easy-to-install mechanism, the FDD of DAMPTECH can fit in many isolation systems. Damptech provides base isolation dampers that can be used for buildings and structure of all sizes: From Low-rise to high-rise buildings. Testing of single FDD units and base isolation model with these devices was conducted on a shaking table facility in Japan as shown on the photos below. Moreover, this concept is applicable to seismic protection of elevated and roof-mounted equipment (water tanks, HVAC units, etc.). 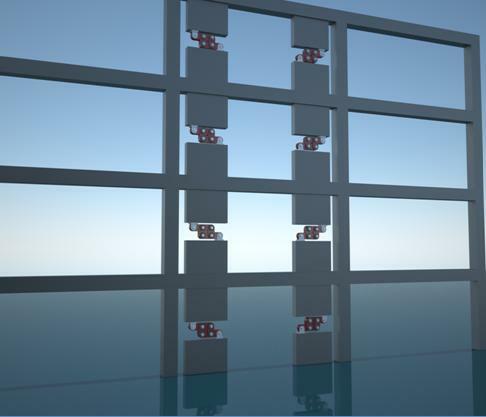 Frictional and combined damper devices of DAMPTECH could be inserted in floor isolation systems as well, which proved themselves suitable for computer rooms and buildings housing high-tech equipment. Panel dampers are a practical and elegant solution for protecting new and existing structures against earthquakes. diagonal bracings but here two panels are used instead of the diagonal bracings. The panel damper can be made to fit typical openings in the building. And they can be designed for any capacity.